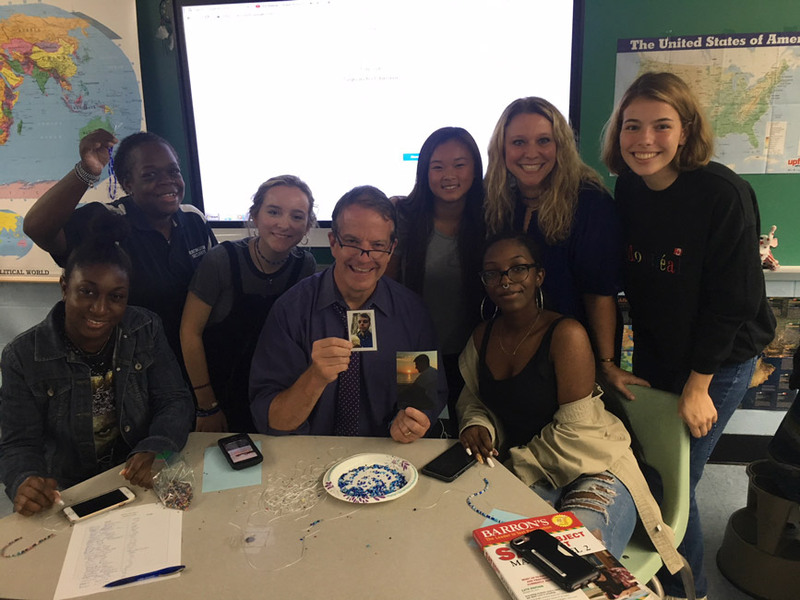 Robert Gilmor III is surrounded by Interact Club members during the rafiki bracelet making session. A Rotary International program for teenagers, Interact strives to carry out hands-on projects and offers members a chance to make international connections, develop leadership skills and have fun while making a positive difference in the world. The Huntington chapter is guided by high school social studies teacher Camille Tedeschi. Natalie McCann serves as president with Noah Morris occupying the position of vice president. Mia Nitekman is the treasurer with Katie Stock serving as corresponding secretary and Phoebe Walther carrying out recording secretary duties. Katie Riley is the historian and Haley Mortell is the organization’s public relations coordinator. Jackson Pitti and Christiana DeLuca are administrative assistants. Huntington Interact Club members most recently gathered to make rafiki bracelets, which they intend to sell to raise monies that will benefit the Michael Gilmor Memorial Scholarship Fund. The son of high school dean of students Robert Gilmor III, Mr. Gilmor passed away suddenly late last summer. The Huntington club is open to any student in the building. There are more than 12,300 Interact chapters in 133 countries. Supported by the local Rotary Club, the high school chapter’s goal is to carry out at least two service projects a year, one local and the other aiding an international organization providing assistance to those in need.